In June before I left Japan for our summer visit back to the United States, I jumped on the bullet train to Nagoya again to spend the day with Isao Yoshino, one of John Shook’s first managers at Toyota in Japan, and visit two of the Toyota museums that I hadn’t had time to get to in April. We were also joined in the morning by Toshiko Narusawa, the co-author with John Shook of the book “Kaizen Express”, and later by two students enrolled in Mr. Yoshino’s business English courses. You can read about what I learned from my first day in Nagoya with Mr. Yoshino and visiting the Toyota City Toyota plant from my post from April 2015: Toyota Lean Leadership Lessons (Part 1) and Gemba Visit to Toyota City, Japan. In the spirit of questions, comments and reflection, the following series of posts are highlights from what I learned at the Toyota museums and from spending time talking with Yoshino-san in June. 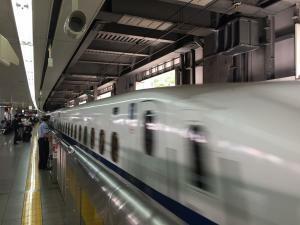 I love riding the Shinkansen (bullet train), and even though the morning of this trip I nearly missed my train, I arrived at Nagoya from Shinagawa station in precisely 91 minutes. 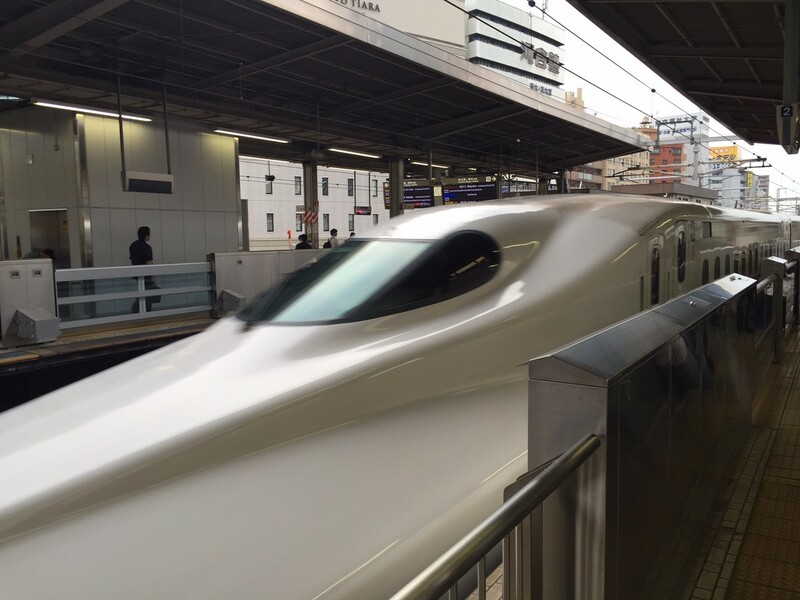 Shinkansen bullet train arrives at Nagoya station. Ms. Narusawa greeted me in the station and as we walked out to meet Mr. Yoshino, we bumped into an unexpected dignitary in Japan. If I hadn’t been with Ms. Narusawa, I wouldn’t have known who this distinguished Japanese business man was, as he blended into the sea of Japanese men in dark business suits. This friendly man, flanked by two other men in dark suits, and Ms. Narusawa exchanged pleasantries, or what I assumed was pleasantries as it was done in Japanese that I didn’t quite understand. While it was clear that he was en route to catch a train, he stopped for at least a minute to talk with Ms. Narusawa. I knew he was someone important as Ms. Narusawa was bowing deeply – more deeply than I’d see anyone bow in Japan in six months! As we walked to the entrance where Mr. Yoshino was waiting for us with a car (Toyota, of course! ), she told me that we had just run into Mr. Cho, the former chairman of Toyota. Mr. Yoshino happily surprised that we ran into him and proceeded to share some of his personal leadership lessons learned from working with Mr. Cho at Toyota. In the late 1990s/early 2000s, Mr. Yoshino was working for Toyota’s marine division in Florida. The boat motor market was a new business that was quite small for Toyota (and from what I gather, it was an experiment that failed in the U.S. market after a few years). At the time, Mr. Cho was not yet Chairman, but he was a very senior leader within Toyota. Mr. Yoshino has having some challenges with the business and reached out to Mr. Cho, who was in California for some leadership meetings. 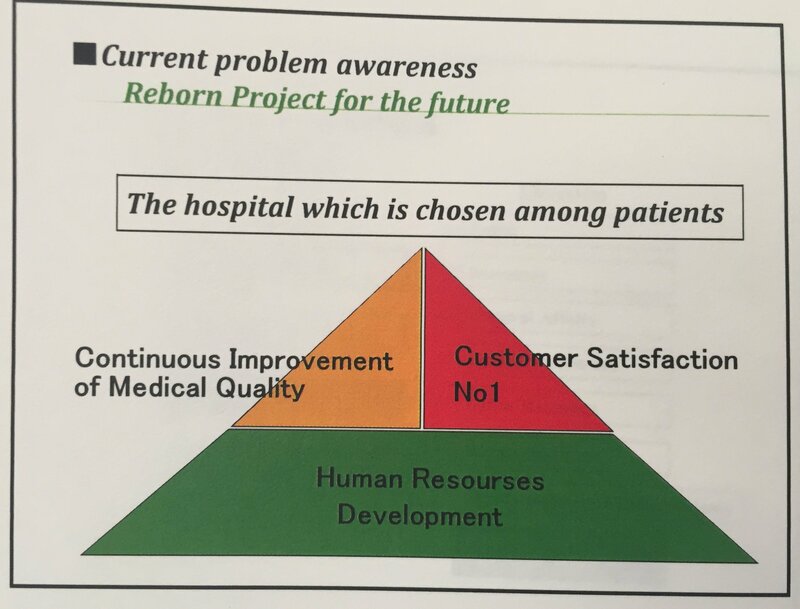 Mr. Cho asked Yoshino “what can I do for you to help?” Mr. Yoshino asked him to “come to Florida” – to go to gemba to see what was going on. Despite not making any other site visits on that trip, Mr. Cho found one day to come out to Florida to see Yoshino. When he arrived, Mr. Cho asked Yoshino, “Tell me the probelm you are facing. What help do you need?”. When Mr. Yoshino started sharing some of the successes he was experiencing as well, Mr. Cho stopped him and said that he didn’t want to be sightseeing – he wanted to be there to see the problems and to help. 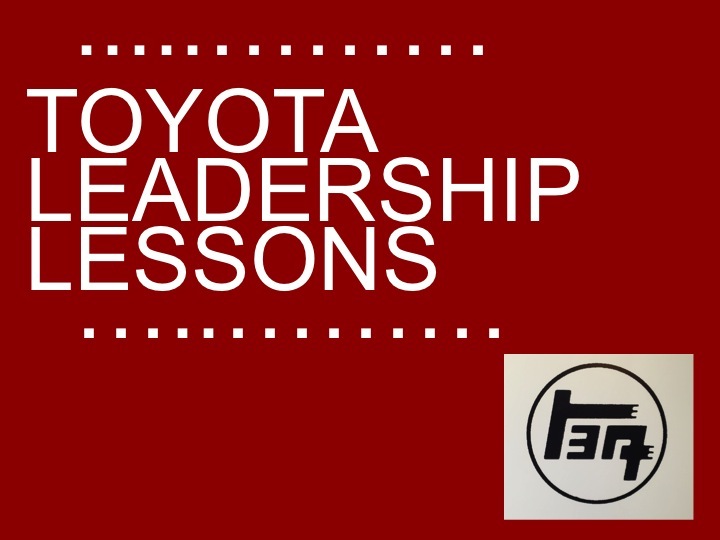 As Yoshino had shared with me previously, Toyota leaders go to gemba to not only learn what is going on, but also to show respect for the people who work for them. This experience had a profound impact on Mr. Yoshino and he expressed deep appreciation and gratitude for this senior leader. I don’t recall Mr. Yoshino sharing with me what the result of Mr. Cho’s visit was, besides saying that the motor business did not do well in the U.S. However, the business outcome was less important than the impact of the leadership behavior that Mr. Cho exemplified. Mr. Cho took the time out of his very busy schedule to fly across the United States to go see with his own eyes what was happening with this fledgling business, to listen and learn how he might help, and to provide assistance to Mr. Yoshino. This experience reinforced for Yoshino the leadership principles he strives to embody as well. 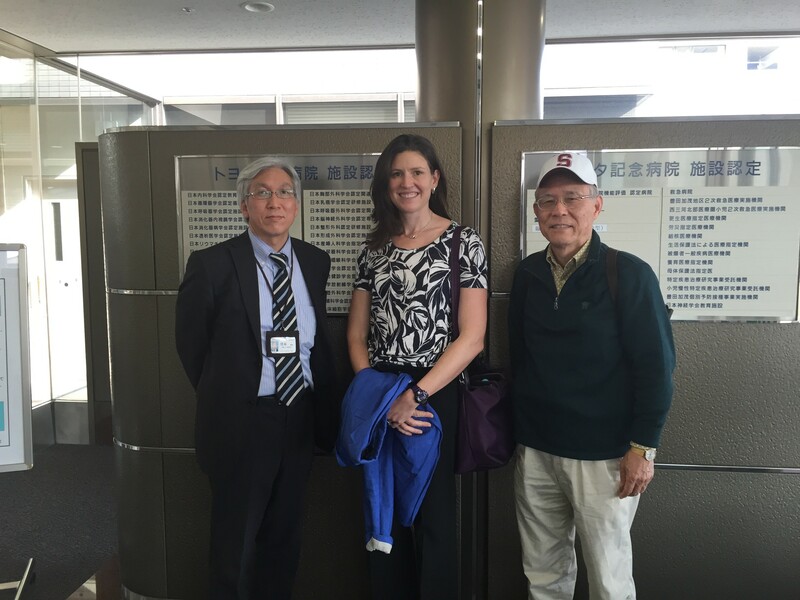 This chance encounter with Mr. Cho was a great beginning to an interesting day of learning, sharing, and driving around Nagoya. Having just started on Twitter, I shared a tweet about the experience as we drove towards the Toyota Commemorative Museum of Innovation and Technology. Literally ran into former #Toyota chairman Mr. Cho at Nagoya train station. Knew he was someone important as my companion was bowing deeply. Stay tuned for posts about the rest of my June trip to Nagoya in upcoming posts. What strikes you about Mr. Yoshino’s experience with Mr. Cho as his senior leader? Please share your thoughts in the comments area below. 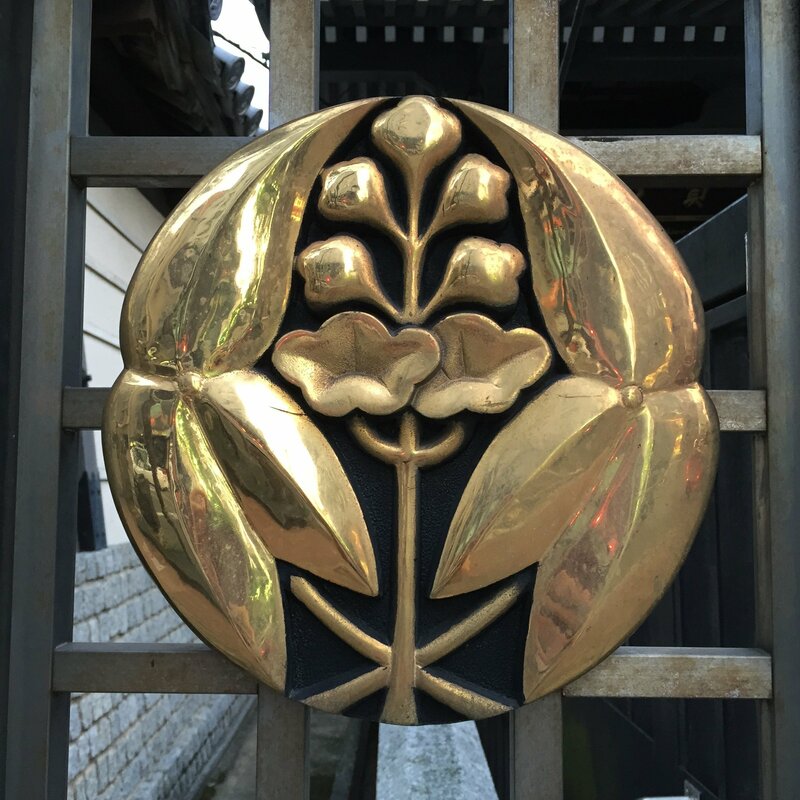 Sign up to receive notifications about new blog posts so you don’t miss out on hearing about the rest of my trip to Nagoya and other reflections on Leadership, lean and life in Japan. You can share this post easily by clicking on the social media buttons below.